According to the U.S. Department of Energy (DOE), there are more than 226,000 manufacturing facilities in the United States. Most of these can economically benefit, to varying degrees, from proper insulation of their steam and process heating systems. Heat is a key ingredient in the creation of almost all manufactured goods. At stake is valuable energy used to transform works in progress into final goods. Proper insulation of industry’s mechanical systems is therefore a central strategy for conserving energy—and money—that otherwise would disappear, literally, into thin air. Accurate measures of the potential market for mechanical insulation are difficult to develop. Most steam-facility managers lack the time and motivation to take inventory of their facilities’ current insulation profiles. In other words, they have no idea how their current insulation usage compares to an economically optimal level. Even if facilities do maintain such inventories, the results are regarded as confidential. How many facilities (and which ones) can benefit from improved insulation? What are specific patterns in the under-application of insulation? What is the range of financial paybacks provided by typical insulation improvements? Definitive answers to these questions remain elusive. However, diligent observers can get a limited view of the insulation market through energy assessments (audits) published by the DOE, whose Save Energy Now (SEN) program is conducting energy assessments for many of the largest industrial facilities in the United States. The DOE began promoting these assessments in the wake of the 2005 hurricane season, which disrupted energy markets. U.S. industrial profitability was severely threatened by dramatic spikes in the price of natural gas and other forms of energy. In an unprecedented policy initiative, the DOE offered free energy assessments on a first-come, first-served basis to facilities that applied for assistance and met eligibility criteria. The DOE’s energy assessments investigate many energy-saving opportunities, not just insulation. Common assessment recommendations also include combustion tune-ups, steam-trap improvements, condensate return, and changes in operating procedures. Participating companies got a detailed, confidential assessment, while a “sanitized” version (with confidential information removed at the recipient’s discretion) was developed for publication. In 2006, 200 such assessments are being produced, with an additional 250 to be delivered in 2007. The initial facilities reviewed included a wide variety of industries and locations. 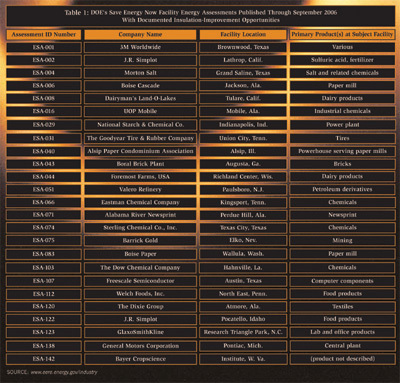 The first 53 facility assessments (through September 2006) are posted on the DOE’s website, www.energy.gov. This first batch of assessments was studied for this article, with a particular focus on insulation recommendations. Insulation opportunities were recorded in 27 (or 51 percent) of the assessments. The facilities that received insulation-improvement recommendations are listed in Table 1. The Boise Cascade report (ESA-006) estimates cost and energy savings due to insulation improvements. The estimated cost for all insulation improvements at this site is $25,000, and related savings should be $80,000 per year. One project—500 feet of piping that supplies 160°F feedwater to a deaerator—would cost about $12,000 and reduce annual energy losses by about $40,000. An insulation survey of the National Starch & Chemical Co. power plant (ESA-029) in Indianapolis, Indiana, covered piping only, but revealed opportunities to save a total of $25,000 per year, at a cost of about $7,000. Goodyear’s production facility (ESA-031) in Union City, Tennessee, features a number of partially insulated process units. Insulation upgrades are estimated to save $402,000 per year, and could be achieved at a cost of $80,000 to $200,000. Sterling Chemical’s facility (ESA-074) in Texas City, Texas, can potentially save $123,000 a year through improved pipe insulation. Dow’s Hahnville, Louisiana, facility (ESA-103) can save 81,100 MMBtu (million British thermal units) in annual natural gas consumption, or $81,000, by improving steam-system insulation. The General Motors facility (ESA-138) in Pontiac, Michigan, features opportunities to repair and replace missing insulation, yielding estimated annual savings of $298,000. Bayer CropScience’s steam facilities (ESA-142) in Institute, West Virginia, feature opportunities to replace or repair insulation on steam distribution and condensate return lines. The annual savings due to these improvements is estimated to be $926,000. The assessments give an idea of industrial insulation potential. Near-term: Improved operating or maintenance practices that could be performed at relatively low cost. These activities could typically be accomplished in a time frame of less than a year. Medium-term: Improvements that require the purchase of additional equipment and/or changes in facility systems. These activities would also require additional engineering analysis, and they could be carried out in a 1- to 2-year time frame. Long-term: Opportunities that involve the testing of new technologies and confirmation of their performance in the context of the subject plant’s operating conditions and investment criteria. These activities might be accomplished in a 2- to 5-year time frame. By these definitions, about 82 percent of all insulation recommendations were near-term opportunities. Fifteen percent were described as medium-term opportunities, with the remainder being long-term opportunities. About half of all these assessments recommended some form of insulation improvement. If this proportion applies to the entire population of U.S. industrial facilities, approximately 113,000 facilities would benefit from insulation improvements. Even companies with award-winning energy-management programs had room for improvement. Some good examples are 3M Worldwide (ESA-001); J.R. Simplot (ESA 002); and Rohm & Haas Company, owners of the Morton Salt facility (ESA-004). Remedial improvements to already-existing insulation represent a significant share of investment opportunities. In fact, this was the most frequently cited opportunity (over a third of all insulation recommendations). Insulation is predominant among “quick-and-easy” energy-saving opportunities. Over 80 percent of all of the insulation-improvement recommendations made were near-term opportunities that would be achievable in less than 1 year. The DOE continues to publish energy assessments generated by its Save Energy Now program. The DOE is continuing the program into 2007, which will make even more reports available for analysis. A more thorough description of the DOE’s Save Energy Now program, as well as information on its assessments and plans for future activity, can be found at www.eere.energy.gov/industry.